Đồng Sĩ Nguyên, also spelled Đồng Sỹ Nguyên, other name Nguyễn Hữu Vũ  (1 March 1923 – 4 April 2019  ), was a Vietnamese soldier and politician. He was Deputy Prime Minister of Vietnam, a member of the Politburo of the Communist Party of Vietnam,  lieutenant-general of the North Vietnamese Army, and minister of transport of Vietnam. He was born in Quảng Bình Province, home to general Võ Nguyên Giáp and Ngô Đình Diệm, president of the Republic of Vietnam. The Deputy Prime Minister of the Socialist Republic of Vietnam, known as Deputy Chairman of the Council of Ministers from 1981 to 1992, is one of the highest offices within the Central Government. The deputy prime minister has throughout its history been responsible for helping the prime minister to handle Vietnam's internal policies. Since Vietnam is a one-party state, with the Communist Party of Vietnam being the sole party allowed by the constitution, all the deputy prime ministers of the Democratic Republic and the Socialist Republic have been members of the party while holding office. There are currently five deputy prime ministers; Trương Hòa Bình, Phạm Bình Minh, Vũ Đức Đam, Vương Đình Huệ, and Trịnh Đình Dũng. The Political Bureau (Politburo) of the Central Committee Communist Party of Vietnam, formerly the Standing Committee of the Central Committee from 1930 to 1951, is the highest body of the Communist Party of Vietnam (CPV) between Central Committee meetings, which are held at least twice a year. According to Party rules, the Politburo directs the general orientation of the government and enacts policies which have been approved by either the National Party Congress or the Central Committee. Quảng Bình, formerly Tiên Bình under the reign of Lê Trung Hưng of the Lê Dynasty, is a province along Vietnam's north-central coast. The province has an area of 8,065.8 square kilometers and population of 857,818 inhabitants The province is bordered by the Laotian Khammouane Province to the west, the North Pacific Ocean to the east, Hà Tĩnh Province to the north and Quảng Trị Province to the south. Historically, this region belonged to Văn Lang and later the kingdom of Champa. Later it was claimed by both the Đại Việt and Champa and officially annexed into Đại Việt by Lý Thường Kiệt, a Lý Dynasty general. Born on March 1, 1923 to a middle-class family in Quang Trung Commune, Quảng Trạch District, Quảng Bình Province, Dong Sy Nguyen attended Sainte Marie Lycée in Đồng Hới. He participated in anti-French political movements and was sought by the French colonists; therefore he fled to Thailand and participated in overseas Vietnamese patriotic movements there. He joined the Indochinese Communist Party in 1939. Quảng Trạch is a district of Quảng Bình Province in the North Central Coast of Vietnam. The district capital is Ba Đồn. This district is divided into 34 commune-level subdivisions and faces the South China Sea. Đồng Hới is the capital city of Quảng Bình Province in the north central coast of Vietnam. The city's area is 155.71 km2 (60.12 sq mi). Population as per the 2013 census was 160,000. It is served by National Highway 1A, the Đồng Hới Railway Station, and airport. By road, Đồng Hới is 486 kilometres (302 mi) south of Hanoi, 195 kilometres (121 mi) south of Vinh, 160 kilometres (99 mi) north of Huế and 1,204 kilometres (748 mi) north of Hồ Chí Minh City. It borders Quảng Ninh District on the west and south, the South China Sea on the east, Bố Trạch District on the north. In 1944, he secretly returned to Vietnam and was made leader of the Communist Party committee branch in Quang Trach Phu, served as editor-in-chief of the Hong Lac Newspaper, built up the Trung Thuan Military Zone, trained the armed forces, and participated in the August Revolution. After the August Revolution, he was nominated as the leader of the Viet Minh in Quảng Bình Province. He was a member of the first session of the National Assembly of Vietnam. The August Revolution, also known as the August General Uprising, was a revolution launched by Ho Chi Minh's Việt Minh against French colonial rule in Vietnam, on August 14, 1945. When the First Indochinese War broke out, Đồng Sĩ Nguyên was assigned the leader of Viet Minh's army in Quảng Bình Province and the provincial army's communist party committee member. In 1950, he was sent to Việt Bắc to attend an advanced level army class, then he was sent to the Bureau General of Politics of Vietnamese Army to act as an envoy in Command wing in Lower Laos in Winter-Spring Campaign of 1953-1954. Việt Bắc is a region of Vietnam north of Hanoi that served as the Việt Minh's base of support during the First Indochina War (1946–1954). In 1954, he was dispatched to the General Staff of North Vietnamese Army, in charge of Civilian Forces Mobilization Department. In 1959, he was promoted lieutenant-colonel. In 1961, he was sent to China to attend Beijing Advanced Military School. In 1964, he came back to North Vietnam and was assigned Vice General Staff for a brief period, then the head of Communist Party Committee of North Vietnamese Army's arm Military Zone IV in 1965, and Chief Command and Head of Communist Party Committee arm in North Vietnamese Volunteer Armed Troops in Central and Southern Laos. The PLA National Defence University is a national university administered by the People's Liberation Army. It is the top university for military education in China. North Vietnam, officially the Democratic Republic of Vietnam (DRV), was a country in Southeast Asia from 1954 to 1975. In late 1965, he was wounded and returned to Hanoi for medical treatment, he was assigned Vice Director of the Bureau of Logistics of North Vietnamese Army and Frontline Logistics, reporting to Dinh Duc Thien. In early 1967 (although he was offered the position in December 1966),  he was assigned Chief-in-Command of 559 Troop, replacing colonel Hoang Van Thai. He remained this position until 1976. Hanoi is Vietnam's capital and second largest city by population. The city mostly lies on the right bank of the Red River. Hanoi is 1,720 km (1,070 mi) north of Ho Chi Minh City and 105 km (65 mi) west of Haiphong. In 1974, he was conferred lieutenant-general. In 1976, he was promoted deputy minister of the Ministry of National Defense in charge of Economic Construction, then Minister of Construction, Minister of Transportation. In 1979, he returned to the military to assume Command-in-Chief and leader of the Communist Party of the Capital Military Zone (an arm of Vietnamese Army in charge of defending Hanoi). He was a member of the secession IV Central Committee of the Communist Party of Vietnam. From 1982, he was an alternate of the session V Politburo then member of Politburo of the Central Executive Committee of the Communist Party of Vietnam (the supreme power body of the Communist Party of Vietnam) (1986–1991) and Vice Chairman of the Council of the Ministers (Cabinet) and Minister of Transport. After he had retired from above positions, he was assigned as a special governmental envoy in charge of Programme 327 (an afforestation programme). He was assigned by Vietnamese prime minister Phan Văn Khải as the special envoy in supervision of Ho Chi Minh Highway. His wife is Nguyen Thi Ngoc Lan, they have 4 sons and 2 daughters. His eldest son is Nguyen Sy Hung, chairman of the board of directors of Vietnam Airlines. Đồng Sĩ Nguyên was interviewed in 2003 and 2004 for the books A History of the Ho Chi Minh Trail, The Road to Freedom and Ho Chi Minh's Blueprint for Revolution, in the Words of Vietnamese Strategists and Operatives by Virginia Morris and Clive Hills   . Phạm Văn Đồng was a Vietnamese politician who served as Prime Minister of North Vietnam from 1955 to 1976 and, following unification, as Prime Minister of Vietnam from 1976 until he retired in 1987 under the rule of Lê Duẩn and Nguyễn Văn Linh. He was considered one of Hồ Chí Minh's closest lieutenants. The Hồ Chí Minh trail was a logistical system that ran from the Democratic Republic of Vietnam to the Republic of Vietnam through the kingdoms of Laos and Cambodia. The system provided support, in the form of manpower and materiel, to the National Front for the Liberation of South Vietnam and the People's Army of Vietnam (PAVN), or North Vietnamese Army, during the Vietnam War. Trường Chinh was a Vietnamese communist political leader and theoretician. He is one of the key figures of Vietnam politics. Together with the communists, he played the main role in the anti-French colonialism movement and finally after decades of protracted war in Vietnam, the communists defeated the colonial power. He was the think-tank of the Communist Party who determined the direction of the communist movement, particularly in the anti-French colonialism movement. After the declaration of independence in September 1945, Trường Chinh played an important role in shaping the politics of the Democratic Republic of Vietnam (DRV) and creating the socialist structure of the new Vietnam. During the transitional period in Vietnam between 1941 and 1956, Trường Chinh was the General Secretary of the Communist Party as well as the real leader of the communist party in terms of designing strategies as well as implementing them. In 1957, after the failure of Land Reform program, he was dismissed from his post of General Secretary and had less power. Hồ Chí Minh selected Lê Duẩn to succeed him as the General Secretary and he became the most powerful person after 1960s. However, Trường Chinh was still an influential thinker in the Party during the second Indochina war and after the reunification of Vietnam. Following the death of Lê Duẩn in 1986, he succeeded Le Duan as top party leader and was the President of Vietnam from 1981 to 1987. His last vital role was to carry forward the Đổi Mới renovation that still affects Vietnam to this day. Group 559 was a transportation and logistical unit of the People's Army of Vietnam. Established on 19 May 1959 to move troops, weapons, and materiel from North Vietnam to Vietcong paramilitary units in South Vietnam, the unit created and maintained the Ho Chi Minh Trail, the supply line that helped the North win the Vietnam War. Nguyễn Minh Triết is a Vietnamese politician who served as the sixth President of Vietnam from 2006 to 2011. He was elected by the National Assembly of Vietnam with 464 votes (94%) in June 2006. Ho Chi Minh Road or Ho Chi Minh Highway is a highway in Vietnam. It runs from the north to the south of Vietnam, west of National Route 1A. The highway was named after Hồ Chí Minh. 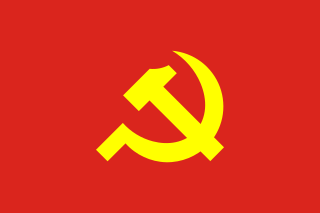 The Central Committee of the Communist Party of Vietnam established 1930, is the highest authority within the Communist Party of Vietnam elected by the Party National Congresses. 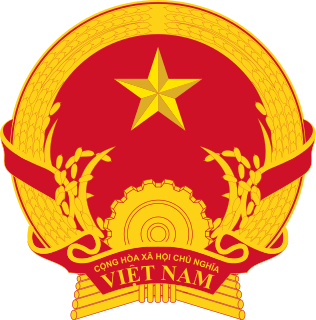 The current Central Committee has about 175 full members and 25 alternate members and nominally appoints the Politburo of the Communist Party of Vietnam. The Leaders of the Vietnam War listed below comprise the important political and military figures of the Vietnam War. The 7th Military Region of Vietnam People's Army, is directly under the Ministry of Defence of Vietnam, tasked to organise, build, manage and command armed forces defending the South East Vietnam. The Hồ Chí Minh Prize is an honorary award given by the government of Vietnam in recognition of cultural and/or scientific achievement. The prize was established by decree in 1981, and has been awarded in 1996, 2000, 2005 and 2012, often posthumously. The prize is named for Ho Chi Minh, and is considered one of the highest honors bestowed by Vietnam. ↑ Chung, Thành (26 February 2010). "Trao Huy hiệu 70 năm tuổi Đảng cho Trung tướng Đồng Sỹ Nguyên". Voice of Vietnam (in Vietnamese). Retrieved 10 April 2011. ↑ Morris, Virginia and Hills, Clive. (2006). A History of the Ho Chi Minh Trail, The Road to Freedom , Orchid Press. ↑ Morris, Virginia and Hills, Clive. (2018). Ho Chi Minh's Blueprint for Revolution, In the Words of Vietnamese Strategists and Operatives , McFarland & Co Inc.